Like most of us, I have known too many individuals diagnosed with cancer, most personally my husband. He was diagnosed in 2015, and after treatment at Dana-Farber has had clean scans at every check-in since completing chemotherapy. Unfortunately, not everyone has a cancer as treatable as his, and too many lose their lives to the disease. I know cures won't come tomorrow, but I also know Dana-Farber's research is getting us closer. I run for Dana-Farber as a small thank you to the doctors, nurses, scientists, researches, and staff that are working simultaneously to treat today's cancer patients and prevent tomorrow's.runners set the pace in the fight against cancer by raising funds to support groundbreaking research and extraordinary patient care. Thanks to your support, Dana-Farber continues to make strides towards the ultimate finish line: a world without cancer. 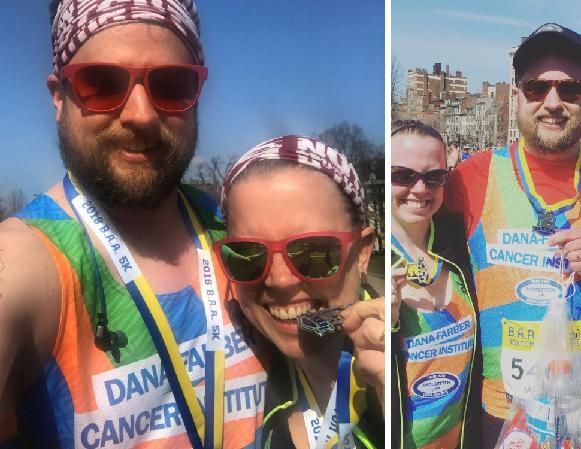 Dana-Farber runners set the pace in the fight against cancer by raising funds to support groundbreaking research and extraordinary patient care. Thanks to your support, Dana-Farber continues to make strides towards the ultimate finish line: a world without cancer. Since its founding in 1947, Dana-Farber Cancer Institute has been committed to providing adults and children with cancer the best treatment available today while developing tomorrow’s cures through cutting-edge research. Cancer is the worst. xo.